This is the best gluten-free white chicken chili crockpot recipe I’ve ever eaten. It’s also a nice change from regular chili. So delicious and everyone you serve will be asking for more! This gluten-free white chicken chili crockpot soup is so easy to throw together with little prep required and makes a hearty meal for a cold night. This is a great soup recipe to make at the beginning of the day and let it cook while you go about your day. You will also get to enjoy the lovely aromas filling your home! I also love how it is comforting, yet light at the same time. This is a dish I bring to family gatherings often because you can get it started ahead of time and let it do its thing and let the flavors all meld together. Then it’s easy to serve it at the end and you can make it fancier and “normal” by topping it with sour cream and Fritos for those who want them. Chicken is also relatively affordable for large groups of people. I also like to make this for my family and then freeze the leftovers for my husband to take to work so he has a home-cooked meal instead of something out of a can. I love how filling it is with the Hispanic twist of flavor. You can also spice things up a bit by upping the spices and adding some cayenne peppers to it. I also like to roast red, orange and yellow peppers in the oven ahead of time and add them into this at the last minute. Oh, and lots of times I will sub in canned jalapenos for the green chilis – or add them. But my family (especially me) likes our food hotter than the average family probably does. 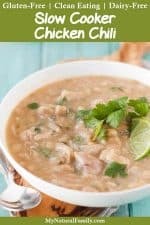 This Slow Cooker Clean Eating Creamy White Chicken Chili Recipe is really good. You can have the benefits of eating chili but it isn’t like other chili’s. Creamy white chicken chili is a popular recipe for a good reason. It’s healthy, light and flavorful. It’s especially easy and flavorful when cooked in a slow cooker. I find myself making this a lot. I actually make it for large group dinners a lot. It’s so easy to throw everything in the pot and let it cook while I clean and get ready for the party. And then dinner is all in one bowl, with a few things as optional toppings to make it a little special. Some things I like to top the chili with are sour cream, fresh cilantro, lime juice, green onion, chopped jalapeños and/or corn chips. Some substitutions and changes I like to make sometimes are canned or fresh jalapeños instead of or in addition to the green chilis. Lots of times I skip the thickening part. I don’t add the milk at the beginning and flour at the end, because I don’t always feel like it’s necessary. The reason I like to use chicken thighs because they have more flavor than chicken breasts and when you cook them for a long time, they don’t dry out, like chicken breast. Another change you could make is to cook it on the stovetop. When I do that, sometimes I use chicken breasts and cook them at the same time I’m cooking the main chili part and add them together at the end. Or I use the chicken thighs and put them uncooked in the pot and bring the whole pot to a boil and let it simmer until the chicken is cooked, generally around an hour or so. I have also cooked the soup in my Instant Pot. You just put all the ingredients in and push the Meat/Stew button and it takes 35 minutes (plus the time to get up to pressure). I would love to know if you have any ideas on additions or deletions or different cooking methods that you use. Please comment below with your ideas. I love gluten-free white chicken chili. It’s so easy to make and tastes so good and I really like this recipe for cooking it in the slow cooker. Definitely a keeper! Love this recipe and have been making it for years now but never left a comment! It’s definitely a family favorite for me! I’m so glad you like it. Thanks for stopping by! Could you please tell me what the serving size is? I cannot find anywhere on here how much is in a serving. I’m sorry it’s so hard to find. Look above the ingredients in the orange boxes. But it has 10 servings. Have you ever made this in an instant pot? If not no worries 🙂 just curious! Thanks! This looks delicious, excited to try it! Actually, that’s about the only way I make it lately. Guess I should put the instructions on the recipe, but really all I do is throw everything in the Instant Pot and press the soup button, which cooks it on high for 30 minutes. Awesome, thank you so much! Excited to try it this week! It makes the chicken texture like butta. I would love to know how it turns out. . .
What is the serving size? One cup? Two? I count .25 pounds of meat as a serving, so this recipe has 10 servings, so it’s a 10th of this recipe. My guess would be roughly a cup of soup. Does that help? I really enjoy this recipe and have made it multiple times. It tastes delicious and is very filling. This is a keeper in my recipe repertoire . 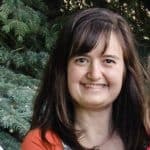 I also have a question about the carb count. That seems really low for having beans in a recipe. I entered the info into my fitness pal and it came out to something closer to 23 carbs. Did I do something wrong? Nice catch. I had selected the wrong type of beans on the nutrition calculator, so it was way off. Now my carb count is even higher than yours. I find the different nutrition calculators to be so different, so it’s hard to know which one to believe, but I tend to like My Fitness Pal. I wish I could use it on my website. I’m glad you like it. We make it a lot too, especially for family gatherings. It’s something everyone likes and it’s inexpensive to feed a lot of people and quick and easy to make. I’m planning on making this today but cutting the recipe in half— should I shorten the cooking time or maybe cook it on low? It looks amazing! It may take a little less time, but not much, like maybe half an hour. What I like to do is make a full batch and then freeze individual servings of it right after I eat it. Then I have several ready to go lunches or dinners with barely any work and they taste totally fine when they are re-heated. What’s the serving size? Trying to watch my calories. I’ve actually made this a couple times and my whole family loves it. Thank you! Absolutely delicious just the way it is! My family raves over this dish and ask for it frequently. The only thing we add to it is a little bit of cheese on top! I may try soaking my own beans next time to really reign back on the sodium intake, but aside from that a total 10🌟 meal! I’m so glad you like it! It’s definitely a recipe we make a lot at our house. Hi, I am planning on having this tonight but I have chicken breasts and have to use the slow-cooker. Can you recommend a cooking time? Maybe just three hours on high? Really looking forward to it! I’ve never done it with chicken breasts and I’m obviously really late answering you, but 2-3 would probably do it, depending on how thick the breasts are. I had to go off dairy for my baby, and I cook with a lot of dairy. A friend shared this recipe with me and it was a nice change up for my husband and me. I love the use of coconut milk! I made this tonight, following your recipe exactly, and it turned out perfectly! We loved it. I made cornbread to go with it and those together were so delicious. My husband loves white chicken chili and this will be our go-to from now on. Thank you! Oh, yes. This WOULD be so good with cornbread. How come I haven’t made that in forever? I love it. Thanks for the reminder . . . When I use my crock pot, I usually put everything together the night before so that all I have to do is pull it out of the fridge and turn it on as I go out the door. Is it OK to “marinate” all the ingredients in the fridge overnight with this recipe? I often do that too. As far as I know, you should be fine. This is absolutely delicious! I am gluten free and dairy free and made this exactly as written. Thanks so much! I’m bringing it to a group dinner! I’m so glad you like it. Yes, I often bring it to group dinners. Lots of times I don’t even add coconut milk or regular milk or thicken it. I just add some sour cream on top and call it good. But, you can totally just sub regular milk for coconut milk. Made this yesterday and my husband and I LOVED it! Will definitely make it again…and again! So good to hear – and thanks for taking the time to comment! Hi! Amazing recipe! One question: can you use frozen chicken thighs? Many thanks! Totally! I almost always use frozen chicken thighs. I just thrown them in frozen and cut them up at the end with tongs and scissors. This is seriously one of the best recipes I have tried for white chili. Thank you! I’m so glad you like it! My family loves it too. Delicious Recipe! Love chicken chili and this is filling and tastes great! And best of all clean! Yes! Clean and gluten-free are definitely a bonus, but I would eat it even if it wasn’t so healthy. Thank you for this recipe. It not only fits my dietary restrictions perfectly but I attended a chili cook-off using this recipe and tied for first place. So you get all the credit for sharing this great recipe! Awesome that you won! That’s so exciting. Just proves that simple recipes are often times the best. I’m pretty excited to be making this tonight, I’m doing a little experimenting… I forgot to pick up a can of coconut milk and don’t want to go back to the grocer so I came up with a possibly brilliant idea. I’ve roaster an acorn squash ahead of time that I will purée and use to replace the coconut milk and I also have the last harvest of my garden bell peppers that I will add because we just love peppers! I hope it turns out well! Thanks for the recipe! Oooh! How did that turn out? Most of the time I just leave out the starch and milk. It’s really not necessary. A little sour cream stirred in is enough for me. Tasted soooo good!!! I’m not the best cook by any means and a very busy person but this looked simple enough to make so I gave it a try and wow, loved it!!!! I’m so glad you like it! I make it all the time and love it too. I don’t have a crockpot. How long would this cook stovetop…low or medium low heat? When I do it on the stove top, I usually use chicken tenderloins and cook it as long as I have time for. An hour would be best, but you can do as little as half an hour if you don’t have time. If you have more time, you can use chicken thighs and cook for about two hours. The longer you cook, the the more flavor it has. This was pretty good,I think I will try it with regular milk once. I think the addition of jalapenos might be beneficial. I would also halve the recipe next time,we have a lot of leftovers. Yes. This does make quite a bit, but it does freeze really well. I freeze individual portions and send it to work with my husband. And it works just great with regular milk too and I often substitute jalapeños for the green chilis – or use them in addition to the green chilies. It’s a very versatile recipe. With the jalapeños or green chilies do you add the liquid too, or just the peppers? I just put the whole can in since there’s not much liquid and what there is tastes good. This recipe is so so SO good and is currently cooking away in my crockpot! Good to hear. Thanks for taking the time to comment. With so many coconut milk options I’m wondering if your recipe is calling for canned coconut milk(which is what I have) or the boxed more liquidy coconut milk? I made this for dinner and it was really good! I didn’t realize it was 3 cans of beans instead of 2, but it still came out really good! I’m glad it came out good. Sometimes I go light on the beans and only use two cans. It’s totally up to you. If I use chicken breasts and just cook them on the stove then how long do I cook the rest of the stuff? Do I still put it on for 5 hours?? If you pre-cook the chicken, basically all you have to do is warm up the other stuff. The longer you cook it, the better flavor it will have (to a certain extent), but plenty of times I just cook it for about half an hour on the stovetop and it’s fine. Please tell me this can be made with regular milk, vs the coconut milk. My husband HATES anything coconut, and if there is the slightest inkling of coconut flavor, he will push the bowl away! Yes. You can totally use regular milk. Hi! What size crockpot are you using? I am wondering if I need to cut this recipe in half. Thank you! Just the regular size – I think it’s 6 quarts. It makes quite a bit, so you may want to half it. Has anyone portioned this out container wise for 21 day fix? Were any adjustments to ingredients necessary? If so, I’d appreciate the share….thanks! Made this today and it is fantastic! Going into the frequently used recipe file. Thank you! I’m so glad you like it! I make it for our family all the time. This is so good to hear. Our family loves it too! Do you drain and rinse the beans before putting them in the pot? Or do you put the whole can of beans in with all of the juices? I drain mine because I’ve heard of you don’t then you get gas. Maybe TMI? but that’s what I’ve heard, so that’s what I do. I’m making this now and just realized my coconut milk is the unsweetened kind. I’m guessing if you made the chili with unsweetened coconut milk it would have been specified. Since this is all I have I’m going to go ahead with it but do you think I should need to add anything to replace the lost sweetness? Can this be cooked on low for 8 to 10 hours? Is it suppose to be two 8oz cans of green chilies or 2 4oz cans, totally 8 oz? Thanks! It should be 16 oz. total I fixed the recipe so it is clear. Thanks. Great recipe! I made this tonight and am in love with the combination of flavors. Thanks for sharing this! You’re welcome! I am glad it worked out well for you! Can I substitute tapioca flour for the arrowroot starch? Yes. Those could be used interchangeable on a recipe like this. Just made this and it is so good! One of the best slow cooker meals I’ve made. My husband loved it! Would you recommend other “milks” for this? Perhaps Soy? Hi! This is the third recipe I have tried from your website and they are all delicious! I am not the best cook but I am concerned about what I eat and really appreciate the time you take to post your recipes. I really enjoy eating something other than baked chicken breast and steamed broccoli. Yes, variety is the spice of life, huh? Thanks for taking the time to comment and I’m glad you like my recipes. hi, what type of bean are you using, is great northern a brand? i’m assuming its a navy bean. what size cans of beans or do you know what amount this would be of dried? thanks! the recipe looks great. Great Northern beans is a type bean not a brand like kidney beans etc. I just get the regular size can. Sorry about the dried beans. I’m just now reading this recipe.& comments. To answer m says, just look for cannelloni beans in the canned goods aisle. They’re large white beans like the red kidney beans. This was excellent! I made this chili this weekend, with slight changes. I love the chicken with the beans, and the touch of cilantro and lime. We served this with tortilla chips, then guacamole one night as well. Thanks for the recipe! It will be a regular in our recipe stash. Thank you for your nice comment, I am glad you like our recipe! I made the recipie but the coconut milk is giving it a strong coconut flavor. Is this suppose to happen? Is there anyway to mask the flavor? Love chicken chili and was excited to find this dairy free version! You could try and kind of alternative kind of milk you prefer if you don’t like the coconut flavor. Do we need to drain the beans before adding to the crockpot? Nope, you don’t need to but if you prefer you could it will turn out thicker if you do drain them. Hi, Can I substitute chicken breast for the thighs? You could but chicken breast get dried out really easy so you wouldn’t want to do it in the slow cooker. Just do it on the stove top until the chicken breast is cooked. I am loving this slow cooker clean eating chili. Looks absolutely delicious! Please let me know if you try it. I would love your feedback. Hey there! I accidentally put the crock pot on low for 5 hours ?. How much longer will it need to cook!? Or should I plan on going out for dinner!? Well, I’m a bit late to answer this. How did it turn out? It should have been fine. As long as your chicken is cooked and you use canned beans, you really only have to warm it up. Any longer time just makes it taste better. This sounds delicious! I haven’t tried making chili in the crockpot before but I put all the ingredients on my shopping list for this week. Thanks for sharing the recipe! Can you use beans that are not in a can? You could use dried beans, but you would need to cook them first. Well, at least part way. For example, when I cook black beans in the slow cooker, I cook them on high for 12 hours, so if you wanted to do that, you would cook just the beans and then add the other ingredients at the end. Or, you can pre-cook the beans and freeze them in individual portions. That’s what I do with my black beans. I need to start doing that with my white beans too . . . I love this recipe. I have gout and do not eat beef or pork so when I see a chili recipe with chicken I like to try it. This looks so inviting to eat. I love white chicken chili, my husband not so much. I do like your slow cooker recipe!!! I make it when he’s gone. This recipes proves that eating clean and healthy can be satisfying! I can’t wait to try this recipe because it looks so hearty and warm which is just what I need in these below freezing temperatures this winter! This sounds soooo good! And I love how healthy it is! This looks awesome and I love that it is clean eating friendly! I would love if you would share this at The Soup-er Recipe Link Up! That looks so yummy! It’s perfect for the chilly weather we’ve been getting here in toronto! I’ll definitely need to try this! White Chicken Chili is one of my favorite soups! I need to try this recipe in my slow cooker. Yum! The cilantro especially caught my eye. I’m thinking this would be great for our Sunday lunch. Thanks!